hi guys, Today I am going to be talking about my drawing that I did for Mauri. The reason why I am going to be talking about my drawing is because I wanted to show you this photo of all of the things that I have in my own life and cultural. For my first drawing, I am going to be talking about my cultural. My culture is Tongan and the reason why I choose Tonga was because I am half tongan and also my Dad is Full Tonga. Also my mum is Cook island but then my DNA matched that I am Half Tongan and Half Cook Island. My Second drawing is going to church. 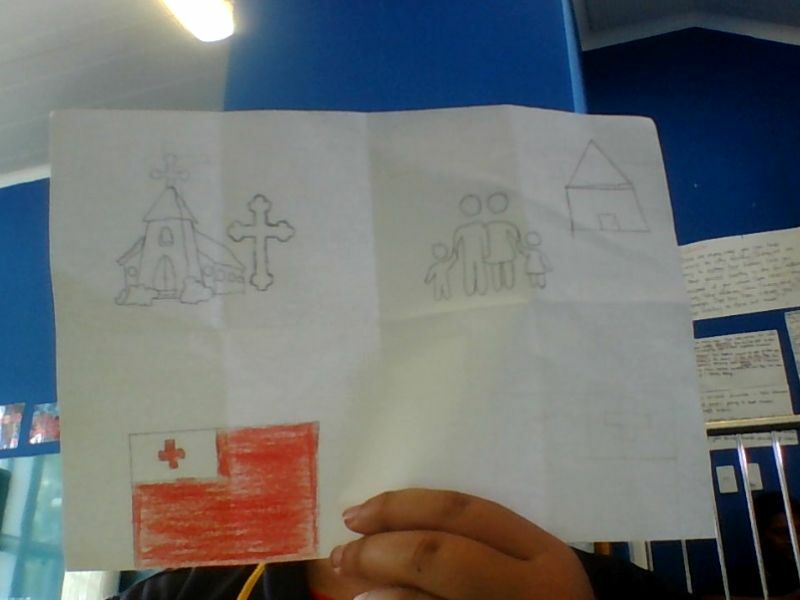 When I was little, I went church with my Grandma and we use to sit on the bench inside a listen to the priest saying things about god in the bible, And also we would sing the song in cook island like a prey. The reason why I chose this is because I wanted to be able to have a good spirit. My third drawing is about my family. My family helps me with my homework because they are helpful to when any one is stuck and also cooperating with each other. Hey there Timeus, my name is Billy and I am from the Summer Learning Journey programme. I hope that you have had a awesome Christmas and are having a safe summer. We really hope you do a bit of blogging this summer and learn about New Zealand's history. I saw on your blog that you recently went to the Auckland Zoo. How did it go? What was your favourite animal?